Also called Oxalis, wood sorrel is another yummy and prolific weed. It has a sour/tart flavor that is delicious in salads. I also find it to be thirst quenching when I nibble on some while weeding. The Latin name Oxalis indicates that this plant has a high amount of oxalic acid but when eaten in moderation in salads or soups rather than in large quantities as a main course the oxalic acid poses no problems. There are many species and the common variety has three heart shaped leaflets that meet at a point. Frequently mistaken for clover (Trifolium) but clover leaves are not so heart shaped. It is also high in Vitamin C and was often used to prevent and treat scurvy. There's a Weed for every Need! This year our garden treat to ourselves was to have Certified Arborist and Host of Garden Talk Radio Bob Carey prune our dwarf evergreens and boxwood. He also cheerfully restructured our Apple Bower and pruned our street tree out front. This is an 'after' shot. At times it was surprising to see how much Bob pruned off of our shrubs. A large part of our goal was to reclaim our side walk as well as reshape the shrubs. These shrubs, planted for winter interest in the herb garden, have grown well beyond our expectations! We asked Bob Carey for a few guidelines and he says: For formal shrub maintenance, to either cut them back or to restrain them be sure to reach inside and cut out sections to let light in because foliage concentrates at the tips. He also adds that when hand pruning a novice is often conservative and takes nips just at the ends. Assess how much material you can remove without causing the shrub to look over pruned. Also cut back at a fork or juncture which opens the shrub for light and creates a looser more open effect. Saint John's Wort, shown here blooming in the garden, has been used for centuries for nerve pain, anxiety and mild depression. It is an effective remedy but is is suggested you try it for 3 to 4 weeks before deciding whether it works for you. We usually suggest a tincture made of the plant instead of the capsules. I love to make Red oil with Saint John's Wort. Pick the flowering tops of Saint John's Wort and place them in a wide mouth jar. Add enough olive oil so that it rises 2 to 3 inches above the herb. Place in a warm sunny location for 4 to six weeks. Strain and use it topically on any wound, swelling, bruises, sprains, etc. The oil should be a deep blood red, the redder the better. From early June through early August we are frequently asked about our Elder tree. It is not a tree really more of a tall shrub but we have pruned it in such a way that it appears like a tree. Elderberry, Sambucus canadensis, is a native American herb with a wide variety of uses. Elder flowers are excellent for the skin. We often make a strong tea of the elder blossoms and use them to make a skin cream. Very soothing. Elderberries which we kindly share some with the birds are small but tasty in jellies and jams. The ripe blue black berries grow in clusters so it is easy to gather a bucket full. Rich in Vitamin A and C and a healthy source of minerals you want to eat only the ripe berries as the green ones and the twigs and leaves give a strong bellyache. The ripe berries are also used as a dye for wool, and of course elder wine, and also an organic blue dye stamp for meats. Sister Marj and I were traveling through Germany on a college age budget and were quite hungry early in the evening before any of the kitchens had even opened up. The bar owner kindly went and frittered us an Elder Flower to have as a snack. Later I found the recipe for frittered elder flowers in the good ole Joy of Cooking cookbook. Not only is this plant used medicinally and for culinary purposes but there is a lot of lore associated with this plant. It is said that the Elder-mother lives on the bottom of the plant and protects the wee folk around her. So before harvesting or pruning the elder it is always wise to announce your presence and intentions to the Elder mother. Just a tip. . . . I can so clearly remember picking bouquets of Dandelions to present to my ever appreciative mother and now I have my own little girl gleefully bringing me countless bright bunches that are closing and dropping even as they are being offered. Is there a little girl anywhere who can resist a field of the golden flowers? 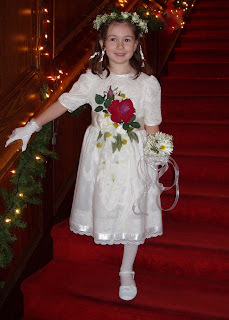 Is there a mother who can resist the little girls who come bearing the flowers? Often considered the number one lawn pest, prolific seed that it is, dandelions may be unwanted, but their history of usefulness to man is as interesting as they are showy. The gold in a field of dandelions is not all on the surface. Centuries of medicinal history has endowed it with its name Taraxicum officinalis, meaning it has been used officially. Today the leaf is used as a wonderful potassium sparing diuretic, while the root is a bitter herb used to help the digestive system function. Older tonic uses were to improve the blood and as an aid in skin diseases. Surely those early green edible leaves were also a valuable addition to diets impoverished by winter. And still are. In my grandparents home frequent dandelion salads were a sure sign of spring. Served with hard boiled eggs and hot bacon dressing, it has become a traditional part of our Easter meal. It can also be served Mediterranean style with an oil and vinegar dressing seasoned with salt and pepper, garlic and rosemary. Steamed and served with a little butter it is considered more wholesome than spinach. In this case you can macerate the leaves by pounding them in several changes of water to extract the bitterness. There are several interesting ways to make the succulent leaves more sweet. Draw the outer leaves up and secure them with a rubber band and allow the centers to blanch as they grow out. Another method is to lay a flat board on a large dandelion plant and it will turn beautifully white. The earliest crispest leaves are obtained by growing a few plants in a cold frame. Every fall I swear I am going to dig dandelion roots, plant them in a box of damp sand and keep them over winter in our cellar – but I always get caught up in other busy-nesses. This will produce a supply of sweet succulent whited leaves for winter salads as choice and crisp and elegant as French endive. No light is necessary for this easy trick. Unopened buds can be added to the butter used to make omelets. Heat the buds gently in the butter and add the eggs and then the buds will open slightly while the omelet is cooking. Dandelion uses are endless, roasted and ground fine it can be added to coffee or drunk alone. Not to mention Dandelion Wine. All minor complaints in my gross mutters house were treated with Dandelion wine, something to avoid at all costs! Better to stay healthy, I always thought. Even the garden fairies enjoy this plant. Helping to disperse the seeds by playing “how many children will I have” Each perfect round seed head is an irresistible fortune teller, blow on it three times and count the remaining seeds to predict the future parenthood. I still like to do that but now I am counting my future grandchildren! When I think of how many millions of dollars have been spent to try to eradicate this amazing plant – it simply boggles my mind. Purslane or Portulaca oleracea grows in most every state and most every where. From rich sandy soils to cultivated gardens to cracks in the cement or in flower pots this opportunistic weed is there. This ground hugging plant rarely grows higher than 2 inches in height but can reach up to 12 inches across. The little yellow flowers open only on sunny days. The succulent stems and leaves taste slightly tart. You can chop up the fresh leaves and stems for in salads. It has been used as a food for more than two thousand years in India and Persia. The mucilaginous stems make it a good thickener to add to soups. Here in PA the purslane is out at the beginning of summer so we do not find it on our early Spring weed walks. Besides being tasty purslane is rich in Vitamin A and also provides some iron and vitamin C.
This is a section of the "funky garden", the garden room with the bathtub, and the tea pot tree and the wringer washer. This year the pots, pans, and milk boxes were all planted with a large variety of Basil plants: purple basil, mammoth leaf, cinnamon basil, lemon flavored basil, dwarf basil, lime basil and others. I like it. Nancy calls it the "yard sale". But I notice she uses the basil none-the-less. Altered Art by TreasureMaker Marj. This Baker's Shrine, approx. 8 inches across, 11 inches high and 3 inches wide is hand made with 1950 original bakers molds and a loaf pan. The pastry chef is cast white metal. 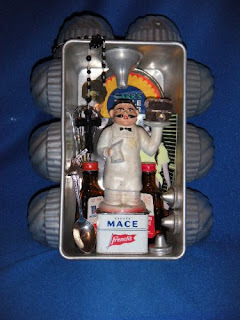 Under and near the Baker you'll find old food coloring bottles, a whisk, a Hershey's spoon and one old can of the Mace/ spice and more....He has some cool girly photos behind him for good luck and a removable strand of rosary beads. This original piece of altered art was designed and crafted by our sister Marj of Rosemary Remembrances in Jim Thorpe and is available for purchase here on Etsy. Marj describes herself as a self-proclaimed pack-rat who loves to take reclaimed, recycled new and old objects and transform them into artful pieces. Earlier this spring we had a workshop where everyone planted their own fairy garden in a rustic trough. The class was for children and mom's working together and the creative results are always so exciting to see! After planting the garden they could decorate it with picket fences, arbors, stone garden paths, swimming pools and whatever other clever ideas they came up with. All fairy-sized of course. We used a miniature thyme appropriately named "Elfin Thyme" which the fairies love to nap upon, a miniature Lavender called "Thumbelina", a dwarf grey leafed sage which is used to make bedding and blankets plus the grey foliage reflects the moonlight for those all night parties! and ~*believe*~ that it will happen. In miniature, just the perfect size for a Fairy Tea Party don't you think? This Swarovski lead crystal tea set (retired) was a gift many years ago from a Rosemary House customer. It enjoys a permanent spot on display in the tea room, with sweet remembrances of a friendship past. Do you have plans in September? 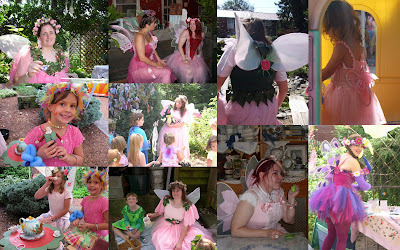 Our Fairy Festival website has been updated with the Schedule of Events for the September festival this year. Held the first weekend after Labor Day, September 12 - 13, the fairies have been spotted frolicking about the garden in anticipation of the festivities. For details, times and performers, please visit here. Fun for all ages! Our children's tea typically features kid friendly food. We begin with baby carrots and a dipping sauce followed by a beautiful plate of fresh fruit with marshmallow cream. The sandwiches today included egg salad triangles and bologna and cheese teapots. We also serve a miniature three tiered tray with the favorites ~ peanut butter bites, jelly triangles and peanut butter and jelly squares. The little heart sandwiches were popular (simply buttered bread cut with a cutter and sprinkled with assorted colored sugars - thanks Marilyn from Heart's Delight for sharing this kid favorite). Scones of course, and a rose decorated cupcake completed the menu. There was a choice of pink lemonade or a pot of tea from our extensive tea list. The young lads and ladies enjoyed a delightful afternoon with moms and grandmas today. A few of my children's tea sets have been moved to center stage for our Please Read to Me Tea tomorrow. 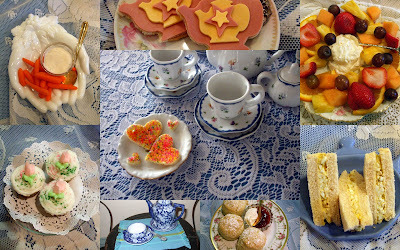 This delightful afternoon includes child friendly tea party food, a grown up sandwich or two, some pink lemonade and/or tea for the kids and the moms. The miniature tea sets will be placed on the tables as centerpieces within easy reach of little hands to play tea party. This tea set, Made in Japan, is on permanent display in the tea room, and marks the beginning of my interest in tea. A gift from my Aunt, many many years ago, it was my first tea set. Dolls, bears, and imaginary friends sipped hot water from these cups as we pretended to savor the special delights of afternoon tea. Complete with a casserole dish, salt and pepper shakers, and another serving bowl, it's not your ordinary tea set. Chips and cracks commemorate the joy and pleasure of many hours of enjoyment from this simple gift. What do you do with all those little magnets that accumulate over the years? My tea themed magnet collection is extensive ~ and they are tucked here and there! Since the tea room also serves dinner, we do occasionally offer coffee with the meals. This collection of tea related magnets decorates the front of the coffee machine. When he was younger, Cedar enjoyed moving them around, redesigning the placement of the magnets; even taking a few to put on the fridge in his home! This quiet collection of magnets hides on the side of the fridge, in the kitchen. 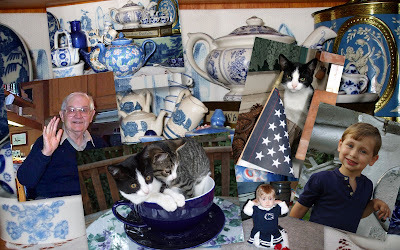 That's Mom in the teacup, always present, looking over my shoulder as I work in the kitchen. And this collection is attached to the inside of the medicine cabinet in the tea room powder room, filling up an otherwise empty cabinet door. Really, I don't need any more tea related magnets; but, why is it that I feel the need to buy one when I see it? 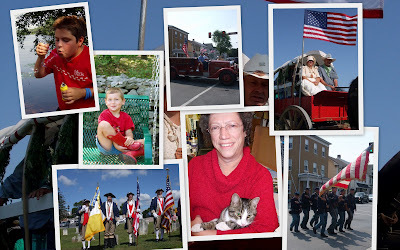 Celebrating Red, White, and BLUE! A glimpse of the blue in our lives! or simply elegant white, wouldn't you say? 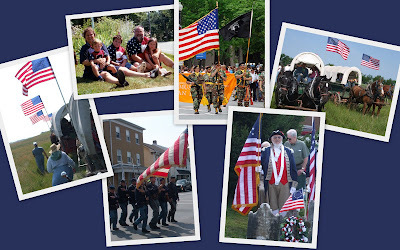 with a glimpse of the colors associated with our country. as the celebration of colors splashes across the Internet. join us as we begin the holiday festivities!